The Rock Party Bus has been a great addition to our fleet, fully licensed and a great space to party and enjoy. The windows are mirrored so you can enjoy your private party. Plus it has a dance floor right next to the bar with a dancing pole. This party venue has everything you need, fully licensed, dance floor and plenty of seats for you to watch the fun and carry more friends! Yes… a fully licensed Party Bus. 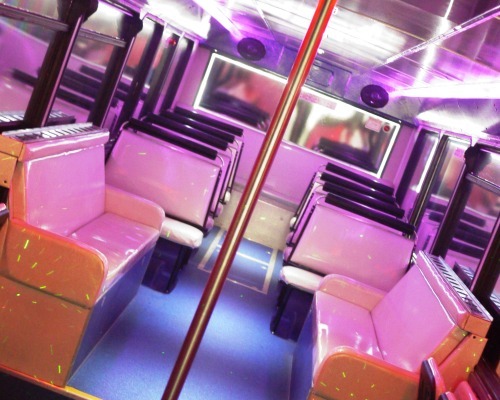 When you book an 18+ event on this great party bus we can serve alcohol! Lighting is an important part of a successful party, LED lighting is all setup for you to set the mood. As far as buses go this has a huge dance floor. Enjoy the best party & fun on the dance floor. Use it to have fun on or if you need to hire in some entertainment for your next hen or stag event. You are provided with your own personal host to take care of the music and drink service. We have designed this fun vehicle with a large number of sideways seating to make a more social event for friends. Seating 41 guests, this great vehicle has the largest capacity out of our licensed vehicles.